We previously reported that naive, tumor-specific CD8+ (TcR-I) T cells transferred into prostate tumor-bearing mice traffic to the prostate where they become tolerized. We now report that TcR-I cells suppress the proliferation of naive T cells. This suppression is mediated at least in part by secreted factors, and the suppressive activity can be blocked by Abs directed against TGF-β. We further report that TcR-I cells must infiltrate the prostate to acquire suppressive activity. Delivery of tumor-specific CD4+ T cells prevents the conversion of TcR-I cells into suppressor cells. Taken together, our findings may have critical implications for sustaining T cell responsiveness during immunotherapy, as the development of suppressor cells in the tumor microenvironment may eliminate the potency of T cells primed in the periphery or delivered during adoptive immunotherapy. The CD4+ regulatory T (Treg)3 cell plays a critical role in maintaining self-tolerance to auto-Ags and is involved in the pathogenesis of various clinical conditions, including chronic viral infections, autoimmune disease, and cancer. Treg cell frequency correlates negatively with cancer prognosis (1), and in murine models the removal of Treg cells or the blocking of their suppressive ability has been shown to enhance immunity to tumors, resulting in delayed tumor growth (1, 2) and improvement of antitumor immunity elicited by cancer vaccines (3, 4). As a result, suppressive T cells are thought to contribute to immune evasion by tumors. Traditionally, studies of CD8+ T cells in immunotherapy have focused on their antitumor effector functions through the induction of CTL activity and the secretion of IFN-γ. However, there is substantial evidence that CD8+ T cells can develop suppressor activities similar to those of naturally occurring and induced CD4+ Treg cells (5, 6, 7, 8, 9). Stimulation in the presence of TGF-β can induce CD8+ T cells to express Foxp3, a transcription factor associated with programming Treg cell differentiation (10, 11). In addition, Suzuki and colleagues have described a naturally occurring population of CD8+CD122+ T cells that exert suppressive function mediated by an IL-10-dependent mechanism (12). The pathophysiological role of tumor-infiltrating CD8+ Treg cells remains less understood than that of CD4+ Treg cells. The presence of IL-10- and TGF-β-expressing CD8+ suppressor cells was detected in colorectal tumor-bearing mice (13), although the antigenic specificity of these cells was unidentified. Expansion of CD8+ suppressor cells has also been reported in cancer patients (14, 15, 16). However, it remains unclear whether these cells are recruited to the tumor as suppressor cells or whether they are tumor-specific T cells that are converted into suppressor cells as a consequence of the tumor microenvironment. In this report, we demonstrate that T cells persisting within murine prostate tumors suppressed the in vitro proliferation of both naive CD8+ and CD4+ T cells, which is mediated in part through TGF-β. The induction of suppressor activity was dependent on the CD8+ effector cells trafficking to the immunosuppressive tumor microenvironment. The ability of tumors to induce suppressive activity in tumor-specific CD8+ T cells may partially explain the consistent failure of adoptive immunotherapy, as these cells may inhibit the effectiveness of subsequent transfers of ex vivo activated, tumor-specific T cells. Transgenic adenocarcinoma of the mouse prostate (TRAMP) (17) and B6C3F1 nontransgenic control mice served as recipients for T cell transfer. The CD8+ TcR transgenic mouse strain (TcR-I) and the CD4+ TcR-transgenic mouse strain (TcR-II) were bred onto a RAG−/− background (18, 19). The TcR transgenic mouse strain 37B7 bears a TcR transgene that recognizes an H-2Kb-restricted epitope of tyrosinase-related protein 2 (TRP-2)180–188 (20). Mice were housed under specific pathogen-free conditions and were treated in accordance with National Institutes of Health guidelines under protocols approved by the Animal Care and Use Committee of the National Cancer Institute (NCI)-Frederick facility (Frederick, MD). SV40 T Ag (TAg)362–384 (TNRFNDLLDRMDIMFGSTGSADI), TAg560–568 (SEFLLEKRI), and TRP-2180–188 (SVYDFFVWL) peptides were purchased from New England Peptide. The OT-II OVA peptide (ISQAVHAAHAEINEAGR) was a generous gift from Dr. T. Sayers (NCI-Frederick). Lymph node (LN) cells from TcR-I and TcR-II mice were prepared in a single-cell suspension. Cell numbers were adjusted to 3 × 106 TcR-I cells or 2 × 106 TcR-II cells to be transferred i.v. into recipient mice. In some experiments, the drug FTY720 (2-amino-2-[2-(4-octylphenyl)ethyl]propane-1,3-diol; Cayman Chemical) was added to the drinking water every 3 days (3.3 μg/ml). Single cell suspensions were obtained from prostate-draining LNs and prostate tissues as previously described (19). Cell suspensions were blocked with Fc block, washed, and incubated with the indicated Abs purchased from BD Pharmingen or eBioscience. TGF-β was detected using the mAb 1D11, followed by a fluorochrome-coupled secondary Ab. For intracellular Foxp3 staining, cells were first stained with CD8 and Thy1.1 followed by staining for Foxp3 (clone FJK-16s). Thy1.1+ TcR-I cells were isolated from prostates and LNs using anti-Thy1.1 Abs followed by streptavidin-conjugated magnetic beads (BD Pharmingen) (19). For suppression assays, graded numbers of positively selected cells, typically 70–80% pure, were added to 1 × 104 responder cells (either 37B7 or OT-II), 1 × 105 splenocytes, and 5 μM TRP-2 or 1 μM OVA, respectively, and incubated for 72 h at 37°C. One microcurie of [3H]thymidine per well was added for an additional 16 h. For TGF-β neutralization studies, anti-TGF-β (R&D Systems) was used at 500 ng/ml. The cultures were lysed using a Tomtec cell harvester (Tomtec) and radioactivity was measured with a MicroBeta TriLux scintillation counter (Wallac). TcR-I cells isolated from TRAMP prostates or wild-type (WT) mice were cultured with splenocytes and 75 ng/ml TAg (560–568) peptide for 48 h. Supernatants were collected, spun at 950 × g, and stored at −80°C. Multiscreen plates (Millipore) were coated with 100 μl of capture Ab (R&D Systems) overnight at 4°C. IFN-γ (1 × 105) or granzyme B (2 × 104) purified Thy1.1+ TcR T cells were added to increasing concentrations of TAg560–568. After incubation, plates were washed and processed as previously described (21). Statistical analyses for differences between group means were performed by unpaired Student’s t test, Welch’s modified t test, or ANOVA followed by a post hoc Tukey’s test as appropriate and indicated in the figure legends. Data are presented as means ± SE. All tests were two-sided and p < 0.05 was considered statistically significant. We previously reported that tumor-specific CD8+ (TcR-I) cells transferred into prostate tumor-bearing TRAMP mice (17) are tolerized following tumor infiltration (19). In the current study, we extended our findings by comparing the expression of cell surface activation markers on tolerant prostate-infiltrating TcR-I cells and naive TcR-I cells. TcR-I cells that infiltrate the TRAMP prostate express the IL-2 receptor α- and β-chains (CD25 and CD122) and GITR (glucocorticoid-induced TNF receptor-related) protein at levels of expression higher than those of naive TcR-I cells (supplemental Fig. 1).4 Many of these surface receptors are also expressed by Treg cells (22). The prostate-infiltrating TcR-I cells expressed detectable levels of PD-1 and CTLA-4, two inhibitory receptors. Interestingly, TRAMP prostate-infiltrating TcR-I cells also expressed high levels of CD103, an E-cadherin-binding integrin associated with suppressive dendritic cells and Treg cells, particularly CD8 suppressor cells (23). In addition, a small subpopulation (∼5–10%) of the prostate-infiltrating TcR-I cells expressed Foxp3 (supplemental Fig. 1). The frequency of Foxp3+ TcR-I cells was considerably lower than the frequency of Foxp3+ cells among the CD4+ cells in the TRAMP prostate (data not shown and Ref. 24). Foxp3 mRNA was also detected in the prostate-infiltrating TcR-I cells. These findings are consistent with those of Kapp et al., demonstrating that a subpopulation of CD8+ cells tolerized to allo-Ag can be induced to express Foxp3 (10), and with a recent report showing the induction of Foxp3 by CD8+ cells following stimulation by osteoclasts (25). Our data suggest that although TcR-I cells infiltrate the prostate and are unresponsive to their cognate Ag (19), they may also have regulatory functions. Therefore, we tested whether prostate-infiltrating TcR-I cells exhibited suppressive activity by purifying the TcR-I cells from endogenous T cells and adding them to Ag-driven proliferation assays using naive CD8+ or CD4+ T cells as responder cells. As demonstrated in Fig. 1⇓A, tumor-infiltrating TcR-I cells suppressed the in vitro proliferation of both melanoma Ag-specific CD8+ (37B7) T cells (20) and OVA-specific CD4+ (OT-II) T cells. Suppression of responder T cell proliferation was TcR-I cell dose-dependent. Even at a ratio of one TcR-I cell to four responder T cells, we observed ∼30% suppression of proliferation. The prostate-infiltrating TcR-I cells also suppressed proliferation of polyclonal T cells (supplemental Fig. 2). Only TcR-I cells isolated from TRAMP prostate tissues displayed suppressive function (supplemental Fig. 3). Prostate-infiltrating TcR-I cells acquire suppressor function. A, TcR-I cells isolated from TRAMP (filled bars) or WT mice (open bars) were assayed for their ability to inhibit the proliferation of naive TRP-2-specific CD8+ T cells (left) or CD4+ OT-II T cells (right). Data are presented as the mean percentage of inhibition of responder cell proliferation ± SEM. *, p < 0.05; **, p < 0.01; and ***, p < 0.001 (left, Student’s t test; right, Welch’s modified t test). Insets display proliferation of responder T cells; dashed line represents proliferation of responder T cells in the absence of suppressor cells; ND, Not detectable. B, Effect of a neutralizing TGF-β (open bars) or an isotype control Ab (filled bars) on suppression by TcR-I cells. Data are presented as the mean percentage of inhibition of proliferation ± SEM. *, p < 0.05; and **, p < 0.01 (using Student’s t test). C, Forty-eight-hour culture supernatants from TcR-I cells isolated from TRAMP (shaded bars) or WT (open bars) mice were added to proliferation assays at the indicated dilutions. **, p < 0.01; ***, p < 0.001 (using Student’s t test). The inset displays the concentration of total TGF-β in the cell-free supernatants. D, Suppression assays using cell-free supernatants were performed in the presence of a TGF-β neutralizing Ab (open bars) or an isotype control Ab (shaded bars). *, p < 0.05; **, p < 0.01 (using Student’s t test). All experiments were performed at least three times. TGF-β has been proposed to be a component of Treg cell-mediated suppression (26, 27, 28). We observed that TcR-I cells isolated from the TRAMP prostate expressed cell surface TGF-β as well as LAP, the latency-associated peptide (supplemental Fig. 1). Therefore, we next tested whether blocking TGF-β would abrogate the suppression by TcR-I cells. As demonstrated in Fig. 1⇑B, suppression by TcR-I cells was significantly blocked by the addition of an anti-TGF-β Ab. Because TcR-I cells secrete relatively high levels of TGF-β into their culture supernatants (Fig. 1⇑C, inset), TcR-I culture supernatants were analyzed for their ability to suppress T cell proliferation. The supernatants from TcR-I cells were profoundly suppressive; even at a dilution of 1:40 the supernatant of purified TcR-I cells was capable of strongly suppressing the proliferation of both CD8+ (Fig. 1⇑C) and CD4+ (data not shown) T cells. Supplementation of a control supernatant with TGF-β resulted in a comparable level of suppression (supplemental Fig. 4). Similar findings were observed when medium was supplemented with TGF-β (data not shown). Moreover, Abs directed against TGF-β significantly reduced the suppressive effect of the TcR-I culture supernatants (Fig. 1⇑D). Currently, other factors that contribute to the suppressive activity remain to be identified. It is possible that cell:cell interactions are also involved, including Fas:Fas ligand interactions, CTLA-4, or cell surface TGF-β, as well as other secreted factors; blockade of IL-10 had minimal effect on suppression by TcR-I cells (data not shown). We next tested whether trafficking to the prostate was required for TcR-I cells to become suppressive. Before transfer, TRAMP mice were treated with FTY720, an immunomodulatory agent that restricts the egress of lymphoid cells from the lymph node, presumably due to its ability to function as a sphingosphine-1-phosphate receptor agonist (29). This treatment resulted in a profound reduction of tumor-infiltrating TcR-I cells (Fig. 2⇓A, inset). When tested in the in vitro suppression assay, the TcR-I cells purified from the lymph node of FTY720-treated TRAMP mice did not suppress the proliferation of naive T cells (Fig. 2⇓A). The lack of suppressive activity was associated with a retained ability to respond to Ag (supplemental Fig. 5). In contrast, the small number of TcR-I cells infiltrating the TRAMP prostate, which either escaped FTY720 treatment or trafficked directly to the prostate after transfer, suppressed the proliferation of naive T cells (Fig. 2⇓A) and were tolerant of their cognate Ag (supplemental Fig. 5). FTY720 did not change the suppressive activity of natural Treg cells isolated from WT mice (supplemental Fig. 6), nor did the addition of FTY720 to the in vitro suppression assay (data not shown). These data demonstrate that infiltration into the immunosuppressive microenvironment of the prostate tumor microenvironment is required for the acquisition of suppressive activity. CD8+ tumor-specific effector cells acquire suppressor activity in the TRAMP prostate. A, TcR-I T cells were isolated from the prostates (striped bars) and the prostate-draining LN of FTY720-treated TRAMP mice (shaded bars), prostates of untreated TRAMP mice (filled bars), or the LN of untreated WT mice (open bars) 7 days after transfer and used in suppression assays. **, p < 0.01; and ***, p < 0.001 (using ANOVA followed by a post hoc Tukey’s test). Inset shows relative number of TcR-I cells following FTY720 treatment. ND, Not detectable. B, Suppressive activity of prostate-infiltrating TcR-I cells when transferred alone (filled bars) or cotransferred with CD4+ TcR-II cells (open bars). *, p < 0.05; **, p < 0.01 (using Welch’s modified t test). All experiments were performed at least three times. We recently reported that the cotransfer of TcR-I cells with TAg-specific CD4+ TcR-II T cells prevents TcR-I cell tolerization in the TRAMP prostate (Ref. 21 and supplemental Fig. 5). Therefore, we next tested whether cotransfer of TcR-II cells would also prevent the induction of TcR-I suppressor activity. As demonstrated in Fig. 2⇑B, TcR-I cells that infiltrate the TRAMP prostate following cotransfer with TcR-II cells did not suppress T cell proliferation and had significantly reduced secretion of TGF-β. This was associated with a decreased frequency of Foxp3+ cells (supplemental Fig. 1). Cotransfer of activated polyclonal CD4+ T cells (which did not infiltrate the prostate in significant numbers) did not prevent suppressive activity (supplemental Fig. 7). Taken together, these findings demonstrate that not only must TcR-I cells infiltrate into the prostate to acquire their suppressive function, but also that prevention of their tolerization is associated with a lack of suppressive function. This report is the first demonstration that a primary tumor can alter not only the functionality of tumor-infiltrating CD8+ T cells by inducing hyporesponsiveness but also convert tumor-specific CD8+ T cells into suppressor cells. TRAMP tumor cells have been demonstrated to express TGF-β, which profoundly affects tumor-specific CD8+ T cell responses (30). However, we have been unable to confirm that TGF-β is required for the induction of TcR-I cell suppressor activity. It remains possible that the TRAMP tumor microenvironment induces suppressive activity in CD8+ cells due to a combination of soluble mediators or by APCs that induce suppression in CD8+ T cells through as yet undefined mechanisms. The conversion of CD8+ effector T cells into suppressor cells may be one mechanism by which tumors restrict the immune response from effectively controlling tumor growth. As subsequent effectors infiltrate the tumor, either following peripheral sensitization or as a result of adoptive transfer therapy, the induced regulatory cells may suppress these new effectors and reduce their ability to confer tumor immunity. This cyclic suppressive process may contribute to the profound loss of antitumor responses following adoptive immunotherapy. We further demonstrated that providing a source of T cell help can prevent induction of the suppressive activity in CD8+ T cells. The activated TcR-II cells that enter the prostate may alter or overcome the tumor microenvironment either by secreting factors to support CD8+ effector T cells or by conditioning tumor-resident APCs that, in turn, prevent induction of suppressor activity in the TcR-I cells. As we further define the mechanisms by which TcR-I suppressor cells are induced, new approaches to block these pathways will enhance our ability to generate more sustained and effective antitumor T cell responses. We thank Dr. Thomas Sayers (NCI-Frederick) and Dr. Karen Hathcock (NCI, Bethesda, MD) for generously providing the OT-II mice and the OVA peptide and Dr. Thomas Wueest (University of Zurich) for critical discussions and technical assistance. We also thank Drs. Joost Oppenheim, Giorgio Trinchieri, Scott Durum, Stephanie Watkins (NCI-Frederick), and Dr. Yasmine Belkaid (NIAID, Bethesda, MD) for critical review of this manuscript and Dr. Octavio Quinones (NCI-Frederick) for expert advice on the statistical analysis. 1 This work was supported by the Intramural Research Program of the National Cancer Institute, National Institutes of Health and the Department of Defense Prostate Cancer Research Program and has been funded in part with federal funds under contract N01-CO-12400 (to K.A.S.-W. and A.M.). K.A.S.-W. was a predoctoral student in the Immunology Program of the Institute for Biomedical Sciences at George Washington University, Washington DC, and this work is from a dissertation in partial fulfillment of the requirements for the Ph.D. degree. 3 Abbreviations used in this paper: Treg, regulatory T cell; LN, lymph node; TAg, tumor Ag; TcR-I, tumor-specific CD8+ T cell; TcR-II, tumor-specific CD4+ T cell; TRAMP, transgenic adenocarcinoma of the mouse prostate; TRP, tyrosinase-related protein; WT, wild type. 4 The online version of this article contains supplemental material. Curiel, T. J., G. Coukos, L. Zou, X. Alvarez, P. Cheng, P. Mottram, M. Evdemon-Hogan, J. R. Conejo-Garcia, L. Zhang, M. Burow, et al 2004. Specific recruitment of regulatory T cells in ovarian carcinoma fosters immune privilege and predicts reduced survival. Nat. Med. 10: 942-949. Zou, W.. 2006. Regulatory T cells, tumour immunity and immunotherapy. Nat. Rev. Immunol. 6: 295-307. Sutmuller, R. P., L. M. van Duivenvoorde, A. van Elsas, T. N. Schumacher, M. E. Wildenberg, J. P. Allison, R. E. Toes, R. Offringa, C. J. Melief. 2001. Synergism of cytotoxic T lymphocyte-associated antigen 4 blockade and depletion of CD25+ regulatory T cells in antitumor therapy reveals alternative pathways for suppression of autoreactive cytotoxic T lymphocyte responses. J. Exp. Med. 194: 823-832. Dannull, J., Z. Su, D. Rizzieri, B. K. Yang, D. Coleman, D. Yancey, A. Zhang, P. Dahm, N. Chao, E. Gilboa, J. Vieweg. 2005. Enhancement of vaccine-mediated antitumor immunity in cancer patients after depletion of regulatory T cells. J. Clin. Invest. 115: 3623-3633. Gilliet, M., Y. J. Liu. 2002. Generation of human CD8 T regulatory cells by CD40 ligand-activated plasmacytoid dendritic cells. J. Exp. Med. 195: 695-704. Rich, S., M. Seelig, H. M. Lee, J. Lin. 1995. Transforming growth factor β1 costimulated growth and regulatory function of staphylococcal enterotoxin B-responsive CD8+ T cells. J. Immunol. 155: 609-618. Zheng, S. G., J. H. Wang, M. N. Koss, F. Quismorio, Jr, J. D. Gray, D. A. Horwitz. 2004. CD4+ and CD8+ regulatory T cells generated ex vivo with IL-2 and TGF-β suppress a stimulatory graft-versus-host disease with a lupus-like syndrome. J. Immunol. 172: 1531-1539. Myers, L., C. Takahashi, R. S. Mittler, R. J. Rossi, A. T. Vella. 2003. Effector CD8 T cells possess suppressor function after 4-1BB and Toll-like receptor triggering. Proc. Natl. Acad. Sci. USA 100: 5348-5353. Fan, T. M., D. M. Kranz, R. A. Flavell, E. J. Roy. 2008. Costimulatory strength influences the differential effects of transforming growth factor β1 for the generation of CD8+ regulatory T cells. Mol. Immunol. 45: 2937-2950. Kapp, J. A., K. Honjo, L. M. Kapp, X. Xu, A. Cozier, R. P. Bucy. 2006. 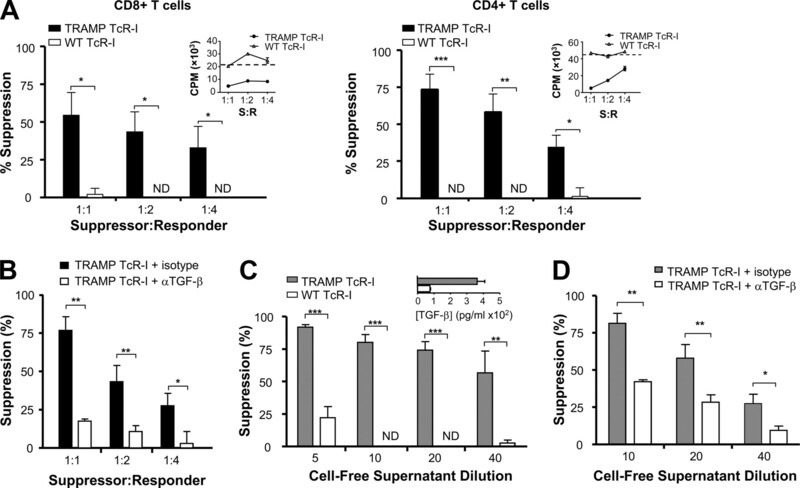 TcR transgenic CD8+ T cells activated in the presence of TGFβ express FoxP3 and mediate linked suppression of primary immune responses and cardiac allograft rejection. Int. Immunol. 18: 1549-1562. Chen, W., W. Jin, N. Hardegen, K. J. Lei, L. Li, N. Marinos, G. McGrady, S. M. Wahl. 2003. Conversion of peripheral CD4+CD25− naive T cells to CD4+CD25+ regulatory T cells by TGF-β induction of transcription factor Foxp3. J. Exp. Med. 198: 1875-1886. Rifa'i, M., Z. Shi, S. Y. Zhang, Y. H. Lee, H. Shiku, K. Isobe, H. Suzuki. 2008. CD8+CD122+ regulatory T cells recognize activated T cells via conventional MHC class I-αβ TcR interaction and become IL-10-producing active regulatory cells. Int. Immunol. 20: 937-947. Jarnicki, A. G., J. Lysaght, S. Todryk, K. H. Mills. 2006. Suppression of antitumor immunity by IL-10 and TGF-β-producing T cells infiltrating the growing tumor: influence of tumor environment on the induction of CD4+ and CD8+ regulatory T cells. J. Immunol. 177: 896-904. Meloni, F., M. Morosini, N. Solari, I. Passadore, C. Nascimbene, M. Novo, M. Ferrari, M. Cosentino, F. Marino, E. Pozzi, A. M. Fietta. 2006. Foxp3 expressing CD4+CD25+ and CD8+CD28− T regulatory cells in the peripheral blood of patients with lung cancer and pleural mesothelioma. Hum. Immunol. 67: 1-12. Kiniwa, Y., Y. Miyahara, H. Y. Wang, W. Peng, G. Peng, T. M. Wheeler, T. C. Thompson, L. J. Old, R. F. Wang. 2007. CD8+Foxp3+ regulatory T cells mediate immunosuppression in prostate cancer. Clin. Cancer Res. 13: 6947-6958. Tsukishiro, T., A. D. Donnenberg, T. L. Whiteside. 2003. Rapid turnover of the CD8+CD28− T-cell subset of effector cells in the circulation of patients with head and neck cancer. Cancer Immunol. Immunother. 52: 599-607. Greenberg, N. M., F. DeMayo, M. J. Finegold, D. Medina, W. D. Tilley, J. O. Aspinall, G. R. Cunha, A. A. Donjacour, R. J. Matusik, J. M. Rosen. 1995. Prostate cancer in a transgenic mouse. Proc. Natl. Acad. Sci. USA 92: 3439-3443. Geiger, T., L. Gooding, R. Flavell. 1992. T-cell responsiveness to an oncogenic peripheral protein and spontaneous autoimmunity in transgenic mice. Proc. Natl. Acad. Sci. USA 89: 2985-2989. Anderson, M. J., K. Shafer-Weaver, N. M. Greenberg, A. A. Hurwitz. 2007. Tolerization of tumor-specific T cells despite efficient initial priming in a primary murine model of prostate cancer. J. Immunol. 178: 1268-1276. Singh, V., Q. Ji, L. Feigenbaum, L. Leighty, A. A. Hurwitz. 2009. Melanoma progression despite infiltration by in vivo-primed TRP-2-specific T cells. J. Immunother. 32: 129-139. Shafer-Weaver, K. A., S. K. Watkins, M. J. Anderson, L. J. Draper, A. Malyguine, W. G. Alvord, N. M. Greenberg, A. A. Hurwitz. 2009. Immunity to murine prostatic tumors: Continuous provision of T-cell help prevents CD8 T-cell tolerance and activates tumor-infiltrating dendritic cells. Cancer Res. 69: 6256-6264. Shevach, E. M., R. A. DiPaolo, J. Andersson, D. M. Zhao, G. L. Stephens, A. M. Thornton. 2006. The lifestyle of naturally occurring CD4+CD25+Foxp3+ regulatory T cells. Immunol. Rev. 212: 60-73. Uss, E., A. T. Rowshani, B. Hooibrink, N. M. Lardy, R. A. van Lier, I. J. ten Berge. 2006. CD103 is a marker for alloantigen-induced regulatory CD8+ T cells. J. Immunol. 177: 2775-2783. Degl'Innocenti, E., M. Grioni, G. Capuano, E. Jachetti, M. Freschi, M. T. Bertilaccio, R. Hess-Michelini, C. Doglioni, M. Bellone. 2008. Peripheral T-cell tolerance associated with prostate cancer is independent from CD4+CD25+ regulatory T cells. Cancer Res. 68: 292-300. Kiesel, J. R., Z. S. Buchwald, R. Aurora. 2009. Cross-presentation by osteoclasts induces FoxP3 in CD8+ T cells. J. Immunol. 182: 5477-5487. O'Garra, A., P. Vieira. 2004. Regulatory T cells and mechanisms of immune system control. Nat. Med. 10: 801-805. Zheng, S. G., J. H. Wang, J. D. Gray, H. Soucier, D. A. Horwitz. 2004. Natural and induced CD4+CD25+ cells educate CD4+CD25− cells to develop suppressive activity: the role of IL-2, TGF-β, and IL-10. J. Immunol. 172: 5213-5221. Sakaguchi, S., T. Yamaguchi, T. Nomura, M. Ono. 2008. Regulatory T cells and immune tolerance. Cell 133: 775-787. Metzler, B., P. Gfeller, G. Wieczorek, J. Li, B. Nuesslein-Hildesheim, A. Katopodis, M. Mueller, V. Brinkmann. 2008. Modulation of T cell homeostasis and alloreactivity under continuous FTY720 exposure. Int. Immunol. 20: 633-644. Shah, A. H., W. B. Tabayoyong, S. D. Kundu, S. J. Kim, L. Van Parijs, V. C. Liu, E. Kwon, N. M. Greenberg, C. Lee. 2002. Suppression of tumor metastasis by blockade of transforming growth factor β signaling in bone marrow cells through a retroviral-mediated gene therapy in mice. Cancer Res. 62: 7135-7138.